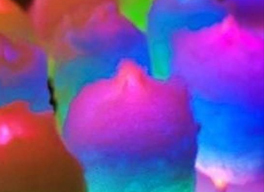 Add colorful LED lighted cotton candy GLO sticks to your cotton candy machine order for $3.25 per stick. These colorful sticks light-up, flash and blink adding flair to your cotton candy. Reuseable.